Tuesday’s turnaround rallies which added over 1% or more to major stock markets have come to a juddering halt Wednesday morning as overnight the Chinese stock market has fallen 3.2%, bringing it very close to a 20% loss since its peak at the start of the month. With 20% losses being seen as an official ‘bear market’, investors are hoping that the decline won’t be the undoing of the spectacular rally seen since July. The FTSE, CAC and DAX all opened around 0.8% down, wiping out all or most of the gains made in response to Monday’s sell off. Today’s main announcements are the release of the meeting minutes from the last MPC meeting at 08.30 GMT and Canadian Core CP at 11.00 GMT. Predictably, these falls in equity markets have led to a flight back to the perceived safety of the dollar and yen. Yesterday the pound was strong after UK inflation showed some resilience, but this morning, Sterling is falling faster than the euro against the dollar and yen. At least the GBP/JPY is managing to hold above Monday’s lows, which is more than can be said for the EUR/JPY. The commodity currencies, namely the Aussie dollar and Canadian dollar are also under pressure despite a big recovery in oil prices yesterday. The GBP/JPY is still yet to revisit its Monday lows, but if this reversal of confidence gathers pace, the pound could have further pain to come. 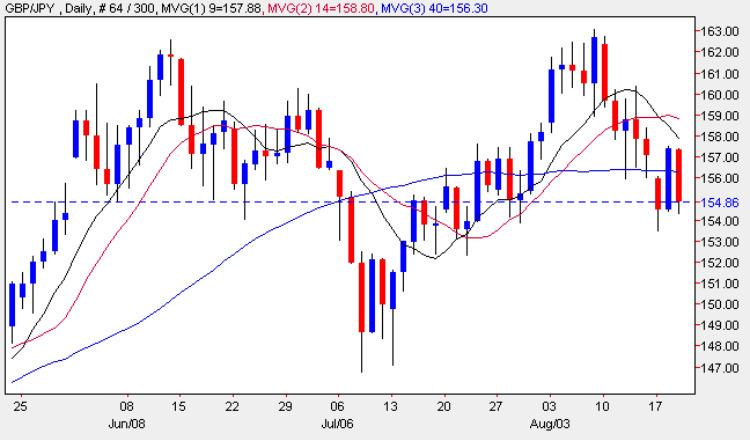 A One Touch trade predicting that the GBP/JPY will hit through 155.50 in the next day could return 146%.